Sustainable food production in the changing climate and windling water resources in the Global Dry Land Allianliance (GDLA) member countries is a real challenge,especially when considering marginal lands in dryland systems. The definition of marginal land is very vague and defined from different perspectives (pragmatism about marginal lands). Dryland itself indicates “marginality” due to water stress. In general, the abandoned agriculture land where food production is not economical,and has low in herent productivity potential is considered marginal; however,a land maybe marginal for agriculture but vital for grazing. In this paper attempts have been made to give review of literature (water stress, extent of marginal saline lands, marginality). 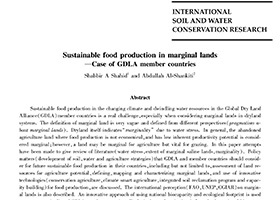 Policy matters (development of soil, water and agriculture strategies) that GDLA and member countries should consider for future sustainable food production in their countries, including but not limited to, assessment of land resources for agriculture potential, defining, maping and characterizing marginal lands, and use of innovative technologies(conservation agriculture, climate smart agriculture, integrated soil reclamation program and capacity building) for food production, are discussed. The international perception (FAO, UNEP, CGIAR) on marginal lands is also described. Aninnovative approach of using national biocapacity and ecological footprint is used to assess marginality of GDLA member countries. Ecological overshoot (using 15 earthplanets) and biocapacity debtor and creditor countries are highlighted. Challenges and best management practices for food production in marginal lands are included. Other important issues, like leasing land abroad, GDLA strategic food reserves and best management practices, innovative ideas for food production are shared. Finally recommendations are drafted for actions by GDLA, its member countries and the partners.